Team 4361 - Roxbotix - is a High School Robotics Team from Roxbury, New Jersey. In participation with FIRST, the team builds a robot & attends competitions within the Tri-State area where they team up with two other teams to compete against three other teams. This fundraiser is to assist Team 4361 in making history. This year, Team 4361 has built a very successful robot. We attended two District Event were we were selected as alliance captains in the quarter-finals. We also went to a Regional out of state event in Rochester, NY where we were selected by another alliance captain to make it as far as the Semi-Finals. 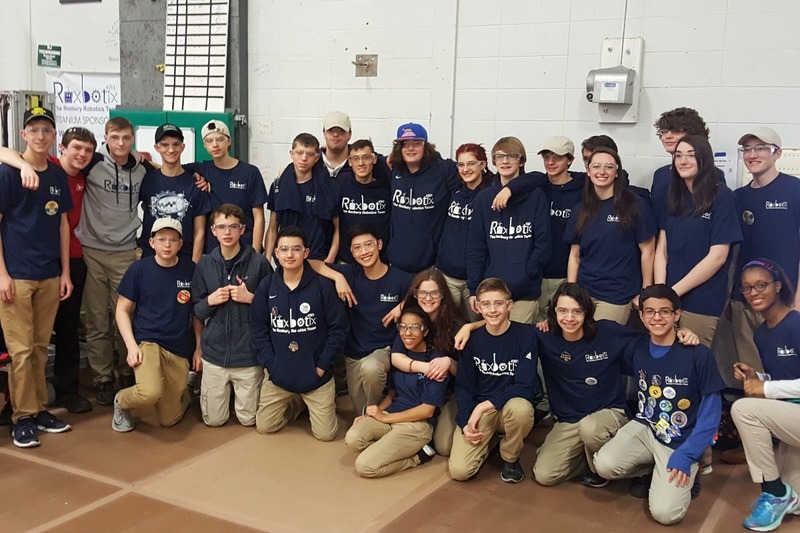 The students efforts paid off in the team competing at the Mid-Atlantic District Championships event this past weekend at Lehigh University in Bethlehem, PA.
On April 7, Team 4361 was chosen in the FRC wait list lottery to attend the World Championship in Detroit, MI. This event will take place from Wednesday, April 25 to Saturday, April 28. However, our kids need your help to raise money to attend this event. We are trying to make their dream become a reality. These kids and mentors have worked countless hours 5 - 6 days a week for 6 straight weeks, building this incredible robot. Our students might not be able to attend due to a lack of funds, unless approximately $10,000 is raised by next week. The money raised will be used towards transportation to and from Detroit, hotel fees, and meals for the students. Any and all donations are graciously accepted. If the deadline is unfortunately not met, the money raised will be saved for the following year so that next year's team may attend the World Championship if the team qualifies. Thank you in advance for your generous time and efforts. ITS ALWAYS MORNING IN ROXBURY!!!! Thank you all who donated. The team arrived safely last night and is at the center waiting to compete. If you would like to still contribute we will be leaving up for a few more days. Thank you all for your generous donations to our team. We still have 1 week to go to raise more money to help offset the cost of the kids to go to this event. Anything that you can donate will be greatly much appreciated.